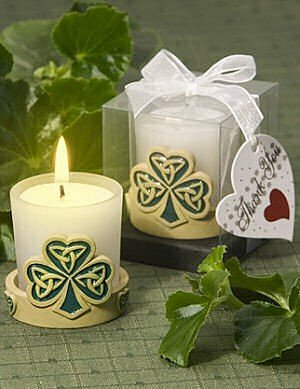 A shamrock themed ivory poly resin base cradles a frosted white glass candle holder on these festive favors. The shamrock has a love knot design representing the weaving together of two lives into one. Candle holders measure 2" x 2" overall. We package each one in a gift box that is tied with a white sheer ribbon and heart-shaped "Thank You" hang tag.